Please register to edit. For assistance, check in with our Discord server or IRC channel. Keine Kamishirasawa (上白沢　慧音, Kamishirasawa Keine) is a were-hakutaku who acts as the guardian of the Human Village. During the events of Imperishable Night, she uses her abilities to conceal the Human Village from the heroines. She shows herself again in the extra stage on the night of the true full moon, having assumed her hakutaku form. Keine is loyal to her duties to the Human Village, both as a schoolteacher and as its guardian. As a proper teacher, she doesn't like people who are discourteous, but other than that, she is generally friendly towards humans - except, perhaps, for when she has assumed her hakutaku form. Keine possesses a different ability for each of her forms. In human form, she can "eat" history, as she did in the events of Imperishable Night. Though it is stated as "eating", it is clear that she is only concealing history from outside viewers. In her hakutaku form, however, she is able to create history; she is also apparently aware of the entire history of Gensokyo in this state, according to her official profile. Hieda no Akyuu, however, states in Perfect Memento in Strict Sense that the Hieda clan's history is above Keine's powers, and is thus not "hers". Keine spends her days as a history teacher in a school in the Human Village, but also acts as its guardian, as she did in Imperishable Night. Prior to the events of Imperishable Night, Keine created a history school in the Human Village, but its popularity is struggling. Attention: This section is a stub and it needs expanding with more information related to the section's topic. If you can add to it in any way, please do so. The kanji characters for Keine translate loosely to "Wise sound" while Kamishirasawa literally means "Upper stream of a white valley." However, the Kamishirasawa kanji can be read as "ue hakutaku" or "uwa-hakutaku" and so likely a pun by ZUN when he named the "Were-Hakutaku" character. "Keine" is also a declensional form of the German word of negative article or negative determiner. Example: "Keine Gurken gibts im Kühlschrank" (lit. "No cucumbers are in the refrigerator"). Although the two words are pronounced differently, Keine's name used in this manner may also be a reference to her ability to conceal history. 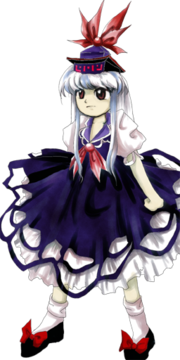 In her human form, Keine has brown eyes and long silver hair with blue highlights. She wears a hat that looks like some kind of building with a red ribbon on top and glyphs inscribed along its side. Her dress is dark blue with white short sleeves, and a red ribbon is tied to the bottom of the collar. In her hakutaku form she has red eyes, long silver hair with green highlights, and horns. Her left horn is decorated with a red ribbon. Her dress is dark green with white short sleeves, and a red ribbon is tied to the bottom of the collar. During Imperishable Night, Keine, being sensitive to the moon herself, sensed the strange events that were occurring. As a safeguard, she hid the Human Village's history, making it as if there had never been a village there to begin with, so that the inhabitants would be protected from any sort of powerful youkai. After being defeated, Keine pointed the heroines toward the ones responsible for the fake moon in the sky. Later, during the Extra Stage, Keine acted as guardian of Fujiwara no Mokou and attempted to stop the player from reaching and facing Mokou. 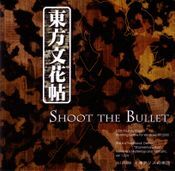 In Shoot the Bullet, Aya Shameimaru encountered Keine on stage 3 and took photos of her danmaku. Keine made a background cameo appearance in Hopeless Masquerade on the Human Village stage. She is seen sitting with Fujiwara no Mokou and clapping her hands as though she's entertained by the fights. Presumably from hearing or seeing a wanted sign about the mischief-making amanojaku Seija Kijin, Keine appears to be one of the many humans and youkai that tries to capture her on day 3. She uses spell cards that are considered impossible to dodge. Keine comments on an alleged "secret society" that is trying to unveil the secrets of the origins of Gensokyo, saying that it's not what humans should be spending their time thinking about; instead, they should be passing down what is happening now as history to their descendants. Some time later, after opening a history school, she notes in her interview with Aya that it isn't very popular. She also comments on Reimu's ineptitude as a shrine maiden in retaining the balance between youkai and humans, and says that she has pretty much taken her place in that role - that is, of being inclined towards humans, rather than youkai. Reisen, Tewi, and Kaguya run into Keine in the Human Village. Keine gives Fujiwara no Mokou an explanation regarding the origins of the Youkai Mountain. Keine is friends with Mokou, she worries about Mokou's health, visits her and they are often seen together in various images in the Touhou games. Keine doesn't really think Reimu is doing her job, by being inclined towards being friends with youkai rather than to serving humans. Keine seems to have a strong desire to protect humans and would probably be the safest person in Gensokyo for any human to be around. When she becomes a Hakutaku, her clothes change color and she seems to grow a tail. Keine fits the description in Perfect Memento in Strict Sense of one who acquired therianthropy, rather than one who was born with it. 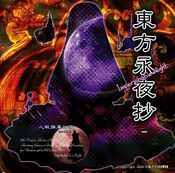 Her transformation into a were-hakutaku is not a full body-transformation, which she points out to Yukari in Imperishable Night, whereas one who is born as a were-beast takes on a full body beast form during a full moon. If this is the case, it would mean Keine was once human but cursed to be a were-hakutaku. 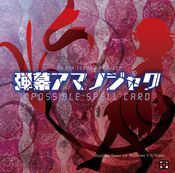 Most of her spell cards are based on the history of the Emperor of Japan. Keine is the only character in Imperishable Night to have 2 Last Word Spell Cards rather than 1. Stage 3 boss. Half human, half beast. She has the ability to eat (conceal) history, and the ability to create history. The former of two abilities belongs to her human form, the latter to her beast form. She's normally in her human form, but her true form is a were-hakutaku. She transforms into a hakutaku during the full moon, at which time all information is known to her. When the full moon disappears, she feels a little sick to her stomach. Ever a friend of the humans, she protects them from Gensokyo's many youkai. There is not one thing about the history of Gensokyo that she does not know. Keine looks like an ordinary human most of the time, but she is actually a were-hakutaku who transforms into a hakutaku under the light of the full moon. As a human, she has the ability to eat histories. As a hakutaku, she possesses all knowledge about Gensokyo, and possess the ability to create history. When she first noticed this incident, she thought it was an opponent with considerably great power, and she decided to seal the Human Village during the night in order to protect humans from youkai. She devoured the village's history to make it unable to be seen. 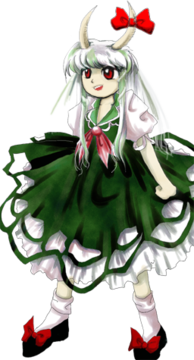 Although Keine is a youkai, she loves humans and always tries to help them. She only uses her ability when it would benefit humans. This page is part of Project Characters, a Touhou Wiki project that aims to write proper descriptions for all official characters of Touhou Project. Please keep the character page guidelines in mind when contributing. This page was last edited on 23 August 2018, at 00:16. Content is available under Creative Commons Attribution-ShareAlike 4.0 International License. unless otherwise noted.